Monte Carlo - How Many? How to make use of the Process Control chart? How to Interpret the Cycle time graph in the Analytics module? Cycle time is the time you need to complete something that you've started working on. This is one of the most important performance metrics in the Kanban world. In the Cycle time article, we clarified the difference between cycle time and lead time and we showed how cycle time could be configured in the system. Generally, the cycle time chart shows how much time it took for a card to make it to Done. Usually, the Workspace managers and the Project Manager analyze it to see why things are taking longer than expected, to spot bottleneck in the process and to support their teams if extra effort/resources are required to complete a given task. Important: By default, only the cards from the configured cycle time columns are displayed on the graph. The configuration can be changed from Project Settings -> Manage Boards -> Configure Cycle time. The cards are ordered from left to right according to their creation time and the dotted blue curve on the top edge of the cards shows the trend over time. Each card in the Cycle time graph is represented as a bar, which visualizes how much time the task has spent in a given process stage/column. The different bar colors represent the different stages in which the task has been throughout its life-cycle. The panel allows you to switch off the stages, which are not relevant to your analysis so they will be no longer visible to the bars. In case that the bar is higher -> this indicates that the task in a certain stage/has been worked longer. From the filter available above the Cycle time graph, you can add dimensions to slice the data. 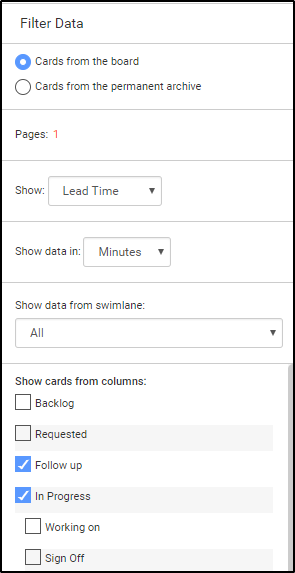 You can filter the cards by: assignee, priority, tag, size, type, color, custom field, field values. From the panel on the left, you control which cards to be displayed - cards from the board or cards from the permanent archive. The graph can show: lead time or logged time (define it from the dropdown) and upon configuration, your data can be presented in minutes, hours or days. Use show cards from columns to define only those columns, which you want to analyze. The cycle time charts will reflect all cards, which are currently on the board.